Researchers have discovered an unusual molecule that is essential to the atmosphere's ability to break down pollutants, especially the compounds that cause acid rain. It's the unusual chemistry facilitated by this molecule, however, that will attract the most attention from scientists. Marsha Lester, the University of Pennsylvania's Edmund J. Kahn Distinguished Professor, and Joseph Francisco, William E. Moore Distinguished Professor of Chemistry at Purdue University, found the molecule, which had puzzled and eluded scientists for more than 40 years. A technical paper describing the molecule is published this week in a special edition of the Proceedings of the National Academy of Science. Somewhat like a human body metabolizing food, the Earth's atmosphere has the ability to "burn," or oxidize pollutants, especially nitric oxides emitted from sources such as factories and automobiles. What doesn't get oxidized in the atmosphere falls back to Earth in the form of acid rain. "The chemical details of how the atmosphere removes nitric acid have not been clear," Francisco says. "This gives us important insights into this process. Without that knowledge we really can't understand the conditions under which nitric acid is removed from the atmosphere." Francisco says the discovery will allow scientists to better model how pollutants react in the atmosphere and to predict potential outcomes. "This becomes important in emerging industrial nations such as China, India and Brazil where there are automobiles and factories that are unregulated," Francisco says. "This chemistry will give us insight into the extent that acid rain will be a future concern." Lester says the molecule had been theorized by atmospheric chemists for 40 years and that she and Francisco had pursued it for the past several years. "We've speculated about this unusual atmospheric species for many years, and then to actually see it and learn about its properties was very exciting," she says. 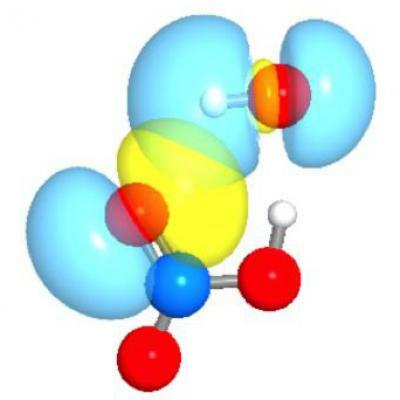 What makes the molecule so unusual is its two hydrogen bonds, which are similar to those found in water. Chemists know that although water is one of the most common substances found on the planet, it has unusual properties. For example, the solid form - ice - is lighter than the liquid form and floats. Water also boils at a much higher temperature than would be expected from its chemical structure. The cause of these strange behaviors are weak hydrogen bonds that hold water molecules together. The new atmospheric molecule has two hydrogen bonds, which allows it to form a six-sided ring structure. Hydrogen bonds are usually weaker than the normal bonds between atoms in a molecule, which are known as covalent bonds. In fact, covalent bonds are 20 times stronger than hydrogen bonds. But in this case, these two hydrogen bonds are strong enough to affect atmospheric chemistry, Francisco says. Lester says the new molecule exhibits its own unusual properties. "The reaction involving this molecule proceeds faster as you go to lower temperatures, which is the opposite of most chemical reactions," she says. "The rate of reaction also changes depending on the atmospheric pressure, and most reactions don't depend on external pressure. The molecule also exhibits unusual quantum properties." Lester says the unusual properties prevented scientists from being able to model the reaction for so long. "This is not how we explain chemistry to high school students," she says. Francisco says that this discovery will be used in areas other than atmospheric chemistry. "Here's a situation where we were studying this purely environmental problem, but, because the findings are so fundamental, it may have broader ramifications to biological systems that depend on hydrogen bonds," he says. The breakthrough was enabled by laser-based laboratory techniques at the University of Pennsylvania and the supercomputing resources available at Purdue, Francisco says. The computation was done on an SGI Altix supercomputer operated by the Office of Information Technology at Purdue. "The key is knowing where to look and how to identify new chemical entities, and with the computing resources we have at Purdue we can help identify processes to within experimental uncertainty," he says. "We couldn't have done this without the supercomputing power that we have available."